Curiously, you won’t find a definition of the modern world in any Vatican II text. But modernity is usually a way of describing the various Enlightenments that emerged in the West from the late seventeenth-century onwards. Among other things, these movements emphasized applying instrumental and scientific rationality to all spheres of life in the hope of emancipating humanity from ignorance, suffering, and oppression. Given the often-vicious treatment inflicted upon the Church by many self-identified moderns—including Jacobins and Bolsheviks—Catholics were often wary of anything asserting to be modern. It’s untrue, however, that the pre-1962 Church was somehow closed to modernity’s genuine achievements. This quickly becomes evident from cursory reading of encyclicals written by popes ranging from Leo XIII to Pius XII. 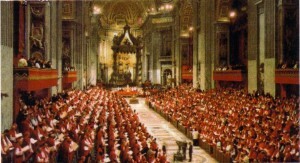 Nonetheless, many Catholics during the 1950s and 60s were tremendously optimistic about possible rapprochements between the Church and modernity. And that includes the present pope. In a 1998 autobiographical essay, Joseph Ratzinger recalled his hopes at the time for overcoming the gaps between Catholicism and the modern mind. A similar confidence pervades Gaudium et Spes, the Vatican II document that specifically attempted to approach modernity in a non-antagonistic manner. Yet even in 1965, many bishops and theologians (including some associated with efforts for renewal) were warning that Gaudium et Spes’ view of modernity was excessively hopeful, even a little naive. Of course the modern world has witnessed tremendous achievements since 1965. Its technological successes are the most obvious. Even diehard traditionalists find it awkward to be uncompromisingly anti-modern when needing dental-care. Likewise the spread of the economic modernity associated with Adam Smith’s Wealth of Nations has lifted millions out of poverty at a historically unprecedented speed. The warnings, however, about undue optimism concerning modernity turned out to be quite justified. The cultural and intellectual chaos that erupted in the late-1960s should have been proof enough. Since then, we’ve witnessed what might be considered an ongoing crack-up on modernity’s part. One symptom is the ever-increasing hyper-specialization and subsequent fragmentation of knowledge. Leading contemporary scholars turn out to have an adolescent’s understanding of anything falling outside their immediate areas of expertise. An accomplished biologist like Richard Dawkins thus resorts to ad hominem arguments when debating God’s existence and displays a rather inadequate command of basic logic. Nor does he even seem to understand why ad hominem arguments are invalid! Yet such developments were predictable. Much Enlightenment thinking was characterized by the desire to arrange information along the lines of an encyclopedia. In this model of knowledge, the subject of “God” is relegated to a line-entry somewhere between “goats” and “gold.” The problem is that such an organizational method makes it easier to avoid acquiring integrated knowledge. Instead you simply pick out the things you want to know about while ignoring or denigrating the rest. Welcome to the modern university. Another characteristic of late-modernity is the manner in which moral arguments are increasingly “settled” by appeals to opinion-polls, choice for its own sake, or that ultimate first-year undergraduate trump-card: “Well, I just feel that X is right.” For proof, just listen to most contemporary politicians discussing the ethical controversy of your choice. Such incoherence, however, owes much to many moderns’ determination to limit reason to scientific rationality. Empirical reason is a powerful tool. But it can’t resolve extra-empirical problems. And once you implicitly deny the existence of extra-empirical reason, there’s really no other basis for answering normative questions other than appeals to feelings. Emotions, however, aren’t a rational basis for settling arguments about anything. But perhaps most seriously, it’s increasingly obvious that most moderns, despite all their freedom-talk, simply don’t believe in free will. Why? Again, it has something to do with many moderns concluding that reason can’t know very much outside the empirical realm. They blithely ignore the truth that scientific inquiry presupposes extra-scientific concepts derived from philosophical logic rather than science itself. One example is the axiom that you cannot admit effects without discerning their cause. Once, however, extra-empirical reason is considered as a mask for essentially sub-rational motivations, our choices can no longer be shaped by our knowledge of the truth about good and evil. Instead we’re little more than, as David Hume proclaimed, the slave of our passions. Modernity’s narrowing of reason’s scope shouldn’t, however, surprise us. It parallels the disappearance of the idea of God as Logos—the Divine creator who acts rationally and purposefully—from most moderns’ horizons. It’s thus logical that late-modernity has witnessed the emergence of neo-pagan mindsets which, like the pagans of old, increasingly ascribe nature with a semi-divine status and propose randomness and chance as the ultimate causes of everything. Here it’s worth recalling that early Christians coined the word “pagan” from the Latin pagus. Originally, this meant “rural dweller.” But it took on the connotation of “country-bumpkin” precisely because Christians regarded clinging to pagan beliefs as characteristic of a close-minded parochialism and irrational comprehension of the universe as a whole. But if modernity is as disordered as suggested, the question inevitably arises: how far the Church can actually dialogue with it? From a Catholic standpoint, dialogue is not about the endless exchange of opinions and experiences à la the “beyond Jesus” nuns. Rather Catholicism presupposes openness to thetruth in all its fullness on the discussants’ part. In this regard, however, many moderns’ constricted view of reason makes them woefully ill-equipped interlocutors. And herein may be one of Catholicism’s biggest challenges in the post-Vatican II era. It’s not simply that some moderns just aren’t interested in revisiting issues that, frankly, might imply significant lifestyle-changes on their part. Unwilling to acknowledge the Logos as the ultimate foundation for everything, many moderns seem stuck in an iron cage of their own making, unable to provide conclusive reasons (beyond question-begging appeals to “change” and “progress”) why they want what they want and do what they do. Given the Church’s conviction that human reason is grounded upon Divine Reason Himself, part of twenty-first century Catholicism’s mission may well involve having to rescue the modern world from itself by providing compelling rationales for modernity’s tangible accomplishments. Greater historical ironies are hard to imagine. This article first appeared in Crisis Magazine. Dr. Samuel Gregg is Director of Research at the Acton Institute in Grand Rapids, Michigan. He is the author of Economic Thinking for the Theologically Minded (University Press of America, 2001) and On Ordered Liberty: A Treatise on the Free Society and Challenging the Modern World: Karol Wojtyla/John Paul II and the Development of Catholic Social Teaching.